Reading Fever Crumb made me nostalgic for the days when books and music talked to each other a bit more. Lord of the Rings, for instance, was surprisingly influential in rock music (T Rex, Led Zeppelin, and so on), board games (Dungeons and Dragons), the hippy press (Gandalf's Garden) and computer games. That doesn't really happen nowadays, when successful books are filmed - and therefore trussed up in copyright law - much more quickly. Even though they are so cinematic, there don't seem to be any immediate plans to film Mortal Engines. Good. It'll be interesting to see what happens to these astonishing, important images if they're allowed to float around in the culture for a while, like pop songs. The latest issue of Carousel has a guest editorial by the new Children's Laureate. As well as the usual reviews the issue contains a full-page profile of Peter Usborne; a feature on David Tazzyman, illustrator of the Mr Gum books, by Rowan Stanfield; an overview of the Children's Book Award; and a 5-page feature titled Sense OF Place, recommending books set in different parts of the UK. Well worth reading - not just another feature with well-worn facts... Did you know for example that 'Lauren' was originally 'Helen' ? Award-winning author, Jane Vejjajiva from Thailand will be flying to the UK, with BA, to take part in the 'Reading Round the World' programme on 22 and 23 June supported by the British Airways Community Investment department. Children from the Hounslow area will have the opportunity to take an imaginary trip to her homeland at The British Airways Community Learning Centre where they will have a multi-sensory experience of Thailand through Jane's novel The Happiness of Kati. 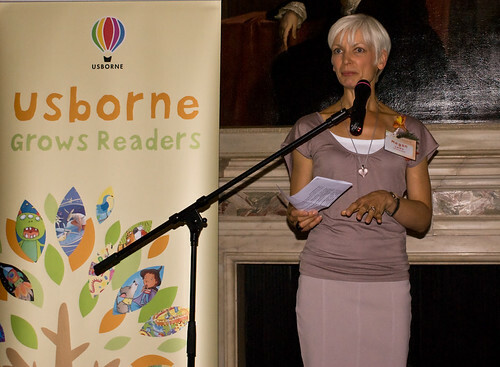 The 'Reading Round the World' project is the brainchild of Outside In (the UK organisation dedicated to promoting and exploring world literature), which is bringing a host of international authors and illustrators to the UK during 2009. This is part of a programme of innovative, fun and highly interactive events that explore and celebrate books from all over the world, particularly children's books in translation. UK children rarely have access to books from other countries and the 'Reading Round the World,' programme not only introduces them to these international books and artists but also promotes cross-cultural awareness and understanding. 'Reading Round the World' is funded by the Arts Council of England, with partnership funding from the British Airways Community Investment Fund, Unwin Charitable Trust, Swedish Arts Council, Daiwa Anglo-Japanese Foundation, Japan Society and the Royal Embassy of Thailand. Outside In was established in 2007 and 'Reading Round the World' is the organisation's first national project. Unfortunately, I've been finding it increasingly hard to find any information on new titles - review spaces in national publications tend to be given over to established authors that I'm already familiar with, as do promotional spaces in bookstores, and while I understand the commercial reasoning behind this, it doesn't particularly help me when I'm stuck on a long train journey. I hope I'm not alone in wanting to discover new, exciting historical fiction or even rediscover old, forgotten historical fiction. For myself, and any other readers of this blog, I aim to rectify this by not only providing other readers, other fans, of historical fiction with comprehensive reviews of new titles, but also offer new authors a platform to promote their work that they wouldn't otherwise have. Melvin Burgess on problems he is encountering in trying to have a memoir of his teenage years published. The gist is that his regular publisher, Andersen Press, has (on legal advice) passed, and Burgess is having to seek an alternative outlet. Browne made an immediate impact with his first book, Through the Magic Mirror in 1976, and cemented it three years later with the delightful conceit of Bear being able to draw his way out of trouble in Bear Hunt. But it was with his trademark gorillas that he won his first prizes and widespread recognition. In Gorilla (1983) a lonely girl with a passion for gorillas, whose father is too busy to take her out, goes on a moonlit adventure to the zoo with a gorilla dressed in her father's coat and hat. It won prizes on both sides of the Atlantic. I am sitting in a room with Jim Rose. He's asked to see me. He says, "We've got the alphabetical principle in place, now the next one to crack is how do we make books come alive?" He looks at me. "What do you do when you go into schools?" I tell him that I perform my poems and do a kind of linked narrative that is a bit like a stand-up comedy routine. "How often do you do it?" About twice a week. All over the country. Been doing it for about 35 years. "Really?" He seems pleased. I'm thinking, why is it a problem to work out "how to make books come alive". Teachers were doing this 20, 30, 40 years ago. There are shedloads of books on the subject. There are teams of advisers working out of local authorities or places like the Centre for Literacy in Primary Education who are training teachers to do this. There are hundreds of writers visiting schools doing this. He says he'll get back to me. He doesn't. Short interview with Anthony Browne, from the ACHUKA archive (late 1990's). As the new Children's Laureate he will champion children's literature in general and picture books in particular. He believes passionately that picture books are often dismissed in the scramble to push children ahead with their reading... "Although I think the Harry Potter phenomenon has been fantastic, I think that maybe children are being encouraged to read chapter books, as they sometimes call them, earlier and earlier." He believes that children, whatever their ages, should be encouraged to read both chapter books and picture books, "as we can all do". Illustrated books, he says, encourage readers to look at pictures carefully, a skill that they can apply to observing the world. Especially as Terry Pratchett was winner in the Fiction & Poetry category. The next Children's Laureate is announced at 11am tomorrow. Someone not mentioned in a recent Independent article which went through some possible nominees - David Almond, Malorie Blackman - is Kevin Crossley-Holland. Crossley-Holland, who recently published a childhood memoir, is a name that was probably in the hat. Anyone with a notion of who it might be? If you are followjng achuka on Twitter, you will have received notification of the overall winner on Saturday afternoon. Click the heading to see the other category winners. Nick escapes Meadow Hill, and Burgess then spends another 200 pages sticking too closely to Dickens, rounding up his own Fagin, Nancy and Bill Sikes. The sexual abuse story fades badly into the background, and when it does finally return, it does so in a way that is both anticlimactic and feels like a failure of nerve from one of the nerviest writers around. There is some sloppy writing and plotting, too, and aside from Muriel's friend Jenny who makes some effort to save Nick, the female characters are unreadable. Fellow lost teen Stella, who initially shows some spark with Nick after he escapes, settles into being merely a passive abused girlfriend who meets a gratuitous end. Likewise, Burgess's attempt at a Dickensian grotesque in social worker Mrs Batts, with her careless evil and Jean Brodie accent, is a joke that never comes off. Much of Nicholas Dane feels like a real, personal attempt to reckon with a deeply uncomfortable but necessary issue, told in Burgess's grimly unsparing voice. What he hasn't done, however, is successfully fit it to a story which services that intention. A reader, perhaps especially a teenage one, will feel properly upset at the horror, and then dismayed as that horror dissipates into something more muddled. which leads Nicolette Jones on to a viewpoint about current approaches to art education. Video trailer for forthcoming novel (July) in which the author, Anne Cassidy, eschews the Hollywood blockbuster big-budget style of some recent book trailers to speak straight forwardly about the book and read an extract. ACHUKA's second five-golden-chick review of the year. And once again for a debut novel.